Rat poison contains a variety of ingredients that work together to kill rodents; however, these substances are also lethal to humans if ingested. The amount of time it takes for symptoms to appear depends upon the amount of rat poison ingested and the number of days it is ingested. It is important to note that symptoms of rat poisoning may occur even when a person hasn’t ingested rat poison. This is because warfarin, a component of rat poison, is also used in medicine as a blood thinner. When rat poison is ingested, sudden nose bleeds that are difficult to control may occur. Additionally, the person may bruise easily and cuts may take longer than normal to clot. Even normal contact with everyday items may cause a bruise. Women may notice bruising under bra straps. Bruising may be noticed near waistbands, watches or rings. Nausea, vomiting and diarrhea are all symptoms of rat poisoning. In some cases, the diarrhea may be blood-streaked. Abdominal cramping and indigestion are also possible. These symptoms may appear suddenly if a large amount of rat poison is ingested; however, if only a small amount of rat poison is ingested daily, gastrointestinal symptoms may appear gradually over a period of days. Less-common symptoms of rat poisoning include hair loss, fever, seizures, nerve damage, lethargy, restlessness, chills, dementia and nasal complications. 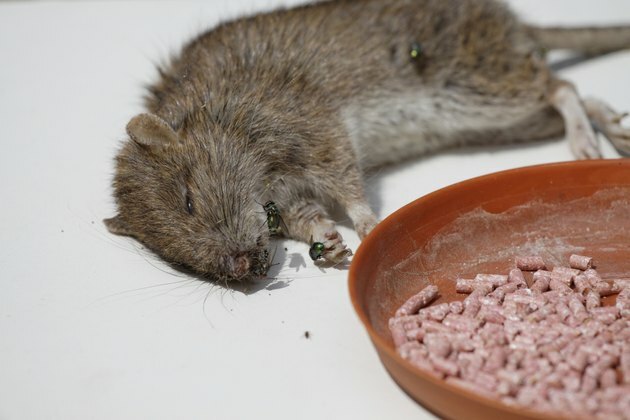 Serious complications of rat poisoning are seizures, respiratory distress, trouble breathing, heart attack, internal bleeding, liver failure, shock and death. Any of these symptoms warrants a trip to the emergency room.